"Best New Artist" redirects here. For other uses, see Best New Artist (disambiguation). The category is also notable for being the only one of its kind in which a Grammy Award was vacated. This occurred in 1990 after it was revealed winners Milli Vanilli did not contribute their own vocals on their debut album. The award was revoked, but was not handed out to another artist. Of the 54 awards presented in the category since its inception, the honor has been presented to 26 solo female artists, 18 duos or groups, and 11 solo male artists. Between 1997 and 2003, all the winners were solo female artists. Also, from 1993 to 2005, no winner was a solo male artist. In 2006, John Legend broke this trend, which started with Marc Cohn in 1992. 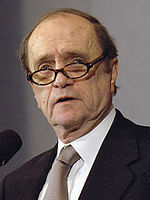 Only four artists have won both Best New Artist and Album of the Year in the same year: Bob Newhart in 1961, Christopher Cross in 1981, Lauryn Hill in 1999, and Norah Jones in 2003. Only two artists have lost Best New Artist yet won Album of the Year in the same year: Vaughn Meader in 1963 and Alanis Morissette in 1996. Of all the winners, only one (Esperanza Spalding) has been a jazz artist and only three have been country artists. In 1997, LeAnn Rimes became the first country artist to win the award. She was followed by Carrie Underwood in 2007 and Zac Brown Band in 2010. Additionally, 2017 marked the first time that two country artists were nominated in this category in the same year, in which Maren Morris and Kelsea Ballerini were both nominated. 1984 marked the first time that all of the nominees were from outside the United States (Winner Culture Club, Eurythmics, and Musical Youth were from England, Big Country was from Scotland, and Men Without Hats were from Canada). Members of the National Academy of Recording Arts and Sciences nominate their choices for best new artist. A list of the top twenty artists is given to the Nominations Review Committee, a specially selected group of anonymous members, who then select the top five artists to gain a nomination in the category in a special ballot. The rest of the members then vote a winner from the five nominees. In 2018, it was announced the number of nominated artists will be increased to eight. These new rules were put on effect starting with the 2017 Grammy season. The category was expanded to include eight nominees in 2019. The Beatles (Members John Lennon, Paul McCartney, Ringo Starr, and George Harrison, clockwise from top left), would go on to become the best selling band of all time. Bobbie Gentry became the first woman to win the award in 1968. José Feliciano is the first Hispanic and blind artist to win the award. 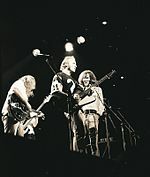 Crosby, Stills, Nash & Young's music unerringly reflected the tastes and viewpoints of the counterculture in the late 1960s and early 1970s. The Carpenters members Karen Carpenter and Richard Carpenter became the first duo to win the award in 1971. 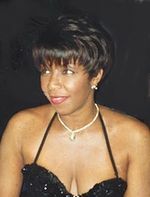 Natalie Cole became the first African-American to win the award in 1976. Cyndi Lauper is one of the few winners who are close to being an EGOT. Mariah Carey's win in 1991 is one of her few wins at the Grammys, despite over 30 nominations. Sheryl Crow won two other awards at the same ceremony, including Record of the Year. Lauryn Hill was the first woman to win for a hip hop record. ^[III] Milli Vanilli were originally presented with the award, but were later stripped of it after it was discovered that they did not perform their own vocals on their debut album. The award was revoked, but was not handed out to another artist, therefore rendering the 1990 recipient vacant. "Grammy Awards: New Artist". Rock on the Net. Retrieved April 24, 2010. ^ "Just what is 'alternative'? - today > entertainment - Music - TODAY.com". TODAY.com. Retrieved February 23, 2016. ^ "The Grammys: The curse of the Best New Artist award?". The Washington Post. Archived from the original on January 25, 2014. ^ "And the winner is ... what's your name again?". TODAY.com. Retrieved February 23, 2016. ^ Taffy Danoff (Interviewee) (2002). VH1's 100 Greatest One Hit Wonders (TV-Series). North America: VH1. ^ "Billboard Magazine. March 8, 1997". Billboard. March 8, 1997. ^ a b Christina Vinson. "Top 10 Country Grammy Awards Moments". The Boot. ^ Shawn S. Lealos (November 3, 2015). "Carrie Underwood sets new record after first six albums debut at number one". AXS. ^ Claire Suddath (February 1, 2010). "Grammy Awards 2010: The Zac Brown Band". ^ Paul Grein (December 7, 2016). "Grammy Whisperer: Eight records that were set in this year's noms". Hits magazine. ^ a b Gates, Chuck (February 24, 1984). "Jackson dominates Grammy list". Deseret News. Deseret News Publishing Company. Retrieved April 24, 2010. ^ Aswad, Jem (June 28, 2018). "Grammys Expand Major Category Nominations From Five to Eight". Variety. Retrieved December 9, 2018. ^ "Grammy Award Nominees 1959 - Grammy Award Winners 1959". www.awardsandshows.com. Retrieved April 26, 2017. ^ "1960 Grammy Awards". www.infoplease.com. Retrieved April 26, 2017. ^ "Grammy Award Nominees 1962 - Grammy Award Winners 1962". www.awardsandshows.com. Retrieved April 26, 2017. ^ "Grammy Award Nominees 1963 - Grammy Award Winners 1963". www.awardsandshows.com. Retrieved April 26, 2017. ^ "Grammy Award Nominees 1964 - Grammy Award Winners 1964". www.awardsandshows.com. Retrieved April 26, 2017. ^ "Grammy Award Nominees 1965 - Grammy Award Winners 1965". www.awardsandshows.com. Retrieved April 26, 2017. ^ "1966 Grammy Awards". www.infoplease.com. Retrieved April 26, 2017. ^ "Grammy Award Nominees 1968 - Grammy Award Winners 1968". www.awardsandshows.com. Retrieved April 26, 2017. ^ "'Now' Singers To Get Grammys". St. Petersburg Times. February 11, 1969. Retrieved April 24, 2010. ^ "Grammy Award Ceremony 1970 - Grammy Award Winners 1970". www.awardsandshows.com. Retrieved April 26, 2017. ^ "Elite of the Record Industry Await the Grammy Awards". The Palm Beach Post. March 14, 1971. Retrieved April 22, 2010. ^ "Hayes, King Top Record Nominees". Deseret News. Deseret News Publishing Company. January 31, 1972. Retrieved April 22, 2010. ^ Campbell, Mary (January 22, 1973). "Grammy Seekers: Musicians Vie For Top Awards". Kentucky New Era. Retrieved April 23, 2010. ^ Deutsch, Linda (January 19, 1974). "Stevie Wonder Nominated For Six Grammy Awards". The Day. The Day Publishing Company. Retrieved April 24, 2010. ^ Shaw, Sarah (February 13, 1976). "Janis Ian Leads Grammy Nominees". Pittsburgh Press. E. W. Scripps Company. Retrieved April 23, 2010. ^ Kalina, Mike (February 14, 1977). "The Grammys". Pittsburgh Post-Gazette. Retrieved April 23, 2010. ^ "Grammy Award Nominees 1978 - Grammy Award Winners 1978". www.awardsandshows.com. Retrieved April 26, 2017. ^ "Newcomer Is Top Grammy Nominee". Sarasota Herald-Tribune. January 20, 1981. Retrieved April 23, 2010. ^ "David Foster Leading Grammy Nominations". Spartanburg Herald-Journal. January 12, 1985. Retrieved April 24, 2010. ^ "Grammy Awards Winners". Grammy Awards. Archived from the original on February 4, 2010. Retrieved March 7, 2009. Note: User must define search parameters as "Sheryl Crow" under "Artist". ^ Pareles, Jon (January 11, 1991). "Grammy Nominees Announced". The New York Times. Retrieved April 24, 2010. ^ Strauss, Neil (January 5, 1996). "New Faces in Grammy Nominations". The New York Times. Retrieved April 24, 2010. ^ Strauss, Neil (January 8, 1997). "Babyface, Celine Dion And Pumpkins Compete For Multiple Grammys". The New York Times. p. 2. Retrieved April 24, 2010. ^ Strauss, Neil (January 7, 1998). "Grammy Nominations Yield Surprises, Including Newcomer's Success". The New York Times. Retrieved April 24, 2010. ^ "Top Grammy nominations". The Register-Guard. January 6, 1999. Retrieved April 24, 2010. ^ "Santana nominated for 10 Grammy Awards". Lodi News-Sentinel. January 5, 2000. Retrieved April 24, 2010. ^ Strauss, Neil (January 4, 2001). "Broad Field, No Standout In Grammy Nominations". The New York Times. Retrieved April 24, 2010. ^ Pareles, Jon (January 5, 2002). "U2 Receives 8 Grammy Award Nominations". The New York Times. Retrieved April 24, 2010. ^ "Grammy Nominations Announced". Fox News Channel. January 7, 2003. Archived from the original on June 29, 2011. Retrieved April 24, 2010. ^ "Grammy Awards nominees battle to stand the test of time". Lawrence Journal-World. The World Company. February 6, 2004. Retrieved April 24, 2010. ^ "Who gets a Grammy?". The Boston Globe. February 11, 2005. Archived from the original on February 17, 2005. Retrieved April 24, 2010. ^ Moss, Corey (February 3, 2006). "Why (Fill In The Blank) Deserves The Best New Artist Grammy". MTV. Retrieved April 24, 2010. ^ Stout, Gene (February 12, 2007). "The best -- and worst -- Grammy moments of 2007". Seattle Post-Intelligencer. Retrieved April 24, 2010. ^ Kot, Greg (February 10, 2008). "The Grammys: Who will win and who won't but should have". The Providence Journal. A. H. Belo. Retrieved April 24, 2010. ^ "The real Grammy drama is in the smaller categories". The Providence Journal. A. H. Belo. February 8, 2009. Retrieved April 24, 2010. ^ "Beyonce tops Grammy nominations with 10 nods". Daily Times. December 4, 2009. Archived from the original on July 9, 2012. Retrieved April 24, 2010. ^ Martens, Todd (December 1, 2010). "Grammys 2011: Justin Bieber, Florence + the Machine and the best new artist crop". Los Angeles Times. Retrieved December 2, 2010. ^ a b c "58th Annual GRAMMY Awards Winners & Nominees". The GRAMMYs. Archived from the original on February 1, 2012. Retrieved February 23, 2016. ^ "Here Is the Complete List of Nominees for the 2017 Grammys". Billboard. Retrieved December 5, 2014. ^ "Grammys 2019: Full list of winners". 9Honey Celebrity. February 11, 2019. Retrieved February 11, 2019. ^ "Past Winners Search". The GRAMMYs. Retrieved February 23, 2016. ^ "GRAMMY Flashback: The Year Without A Best New Artist". POP! Goes The Charts. Retrieved February 23, 2016.